by AFP. December 21, 2010. 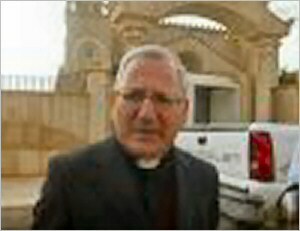 KIRKUK, Iraq (AFP) — Al-Qaeda threats against Christians have led to Christmas festivities being cancelled in the northern Iraqi oil hub of Kirkuk, its Chaldean Catholic archbishop said on Tuesday. "The Christians of Kirkuk will not celebrate the feast of Christmas this year, except for masses, which will not be held at night but at 10 am, after myself and 10 other Christian personages received threats from the so-called Islamic State of Iraq," Monsignor Louis Sarko told AFP. "I fear that Christians will be targeted, which is why all ceremonies have been cancelled." The Iraqi affiliate of Al-Qaeda, the ISI, claimed responsibility for an October 31 attack on a cathedral in Baghdad in which 44 Christian worshippers, two priests and seven security force personnel were killed. It said it acted to force the release of people who had allegedly converted to Islam from Christianity and were being detained by the Coptic Church in Egypt. Days later it declared Christians everywhere "legitimate targets." Less than two weeks after the church attack, a string of bombings targeting Christian homes and shops in Baghdad killed six more people. "You would have to be blind not to take seriously the demands of the mujahedeen (holy warriors), and that will cost you dearly," Sarko quoted an ISI email as saying. "You must listen to our demands and condemn the Christians in the church in Egypt who are fighting our brothers and sisters who have become Muslims. "You must make the same effort to free our sisters who are imprisoned in the churches of Egypt that you do to save Tareq Aziz from hanging." Aziz, the only senior Christian member of Saddam Hussein's regime, was handed the death penalty on October 26 for the suppression of Shiite religious parties in the 1980s. Sarko's announcement comes a day after human rights group Amnesty International called on the Iraqi government to step up protection of Christians. Amnesty "called on the Iraqi government to do more to protect the country's Christian minority from an expected spike in violent attacks as they prepare to celebrate Christmas," the London-based group said in a statement. "Attacks on Christians and their churches by armed groups have intensified in past weeks and have clearly included war crimes," Malcolm Smart, Amnesty's director for the Middle East and north Africa, said in the statement. "We fear that militants are likely to attempt serious attacks against Christians during the Christmas period for maximum publicity and to embarrass the government," Smart added. Between 800,000 and 1.2 million Christians lived in Iraq at the time of the US-led invasion of 2003 that toppled Saddam's regime, but their number has since dropped to about 500,000 as many have fled abroad. The multi-ethnic oil hub of Kirkuk now has only some 10,000 Christians, compared with 50,000 before the invasion.